Some time ago I bought the, at the time, new E3D Chimera+ Watercooled hotend and some extra stuff for it. I’ve had a bit of issues getting it up and running as the first pump/Reservoir combo I bought from China didn’t work. A reservoir is just a container where extra water is stored to make sure the system doesn’t run low. It also makes it easier to fill up and maintain, and catch the air/bubbles the bubbles you always have in a new watercooled setup. All of these things can be done without a reservoir, but it makes it a lot easier to get going and easier to maintain and keep a look on waterlevel. I’ve done a lot of custom watercooling on computers, servers and rack equipment (yes, you can watercool a switch and U1 server), so went into the basement to find some spare equipment. So, why did I buy a Chinese pump when I allready had a lot of watercooling equiptment the smart reader might ask, and the answer is simply that I figured my pumps were far too powerfull, and yes, they were still too powerfull when I looked at them again, hehe. My tubings also didn’t match precisely, which I could have worked around and I needed to print some Nylon barbs to work as an adapter from E3Ds bowden solution to the tubes – You can now buy a Water-cooling barbed adapter kit seperately from E3D, which you couldn’t at the time of my purchase… I could do all this, but I still needed a new pump and reservoir. Or I could buy the Watercooling kit from E3D and get going. This would also make it possible for me to get a look at their new stuff and document it for you in the form of STEP files on GrabCad. Since I’m using my new xBot Chimera+ Watercooled Carriage I need to both setup a new Tool (the second nozzle) which encludes configuring nozzle distance from each other, configure BLTouch placement in regards to my Nozzle, and reset my Z-offset of my BLTouch. Finally I’ll need to redo the coordinates used to do my probing sequce to autolevel my bed.. yes, it’s a lot actually, but taking it one step at a time, and it’s usually not really that hard. I’ll recommend writing down what you do, if you are like me and work well with having documented what you do and what to do. Regardless of the details of your documentation I’ll strongly recommend you do not delete or change existing setup lines, but instead comment them out using ; and create a new line of code, for your new setup. Lets first add a new tool using M563 for our second nozzle by editing the config.g file. This includes defining which heater and extruder we are going to be using as well as the relative position it has to the first nozzle. You can name the Tools if you like, which will show up in your web display. I’ve named them Nozzle1 and Nozzle2 respectively. The Tool ofset is defined using G10 and in relation to the origin of the head. I might have used the point between the two nozzles as the origin and defined offset as -10 and +10 on the X axis respectively, but I’m going to be using Nozzle 1 as the origin. This means the offset coordinates for Tool0 are all just 0. 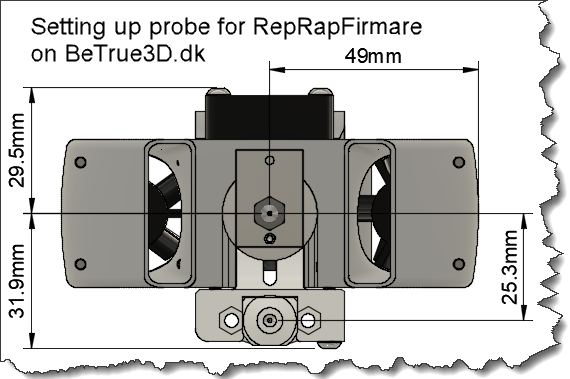 Note on Fans: If you use the default recommend fan0 as print object cooling fan, you do not need to define a fan. Next up we need to modify the BLTouch position in relation to the Head Origin, which in our case is the first nozzle Tool0. It is our G31 in the config.g we need to modify. Just leave the Pnnn value as is. The BLTouch is placed 10mm to the right of the nozzle, which is X10 and 24,26mm in front of the nozzle, which translates to Y-24.26. Important: Do not use , as normal in metric systems when denoting decimals when defining the gcode. We are going to set Z offset to 0, and setup this again later to match our new carriage. My Mesh grid is spanning the area from X5,Y5 up to X205,Y165 and probing every 10mm. Tip: When doing initial setup of the Bed I like to make the probing distance larger, at 20mm to get a rough map to use for manual adjustment. ; ## Nozzle Distance from BED - Offset. Higher value, closer to bed. Move your sensor to around the middle of the bed. You might even want to make a Macro for this, as it can be usefull for many different cases. Move Z untill your nozzle is about 10cm (4 inches) from the bed. Be ready to click the Emergency Stop in case the probe misbehaves. Your BLTouch should now send the Pin Down and your bed should now move up (or nozzle down) untill the BLTouch is triggered. Hit the Emergency Stop if it didn’t stop or the Pin didn’t drop down. Go through your deployprobe.g if the Pin didn’t drop down. With #2 successfull you put your sensor over the middle of the bed and jog Z axis untill your nozzle is touching the bed. Note: If it refuses to move as it has reached Z-minima you can type in G92 Z5 to tell it, that you are 5mm from Z=0. Now send G30 S-1 at which point the Pin drops down and the z-axis closes the gap until the BLTouch is triggered. Z now stops moving and reports the current position without changing anything. Note down the reported value. You might want to repeat the steps 4-6 a few times to insure consistency. I personally just did it 2 times and later did final adjust by looking at print starts. I should insert 2,4mm now, but I’ll detract 0,2 as a safety margin, so I’ll change the Z parameters in the G31 line from 0 to 2.2. Important: The higher Z value the closer you move the nozzle and bed to each other! It’s better to have a value too low here than too high to avoid the nozzle and bed doing a mating game when homing. Important: If you later redo the offset method you should reset the offset to Z0 before starting or it might lead to strange results I’ve found on some occasions. Since the xBot is using 3x independent motors for our Z axis we need to define the coordinates of the leadscres in relation to the hotend and carriage combination we are using. The Drawing is not made specifically for the my current xBot Carriage Chimera+ Watercooled but instead lising the dimensions in relation to the rear center manual finger screw. I did it this way to make it easier for people to use their own favorite carriage and hotend solution. If you want indepth explanation on what I’m doing here, you should read the section on Z-Leadscrew Placement. Before starting you should check if your X and Y -maxima coordinates should be changed. I needed to change mine. Now home your X and Y axes, then move your carriage to the center rear, so BLTouch is lined up to the rear fingerscrew. The position reads as X97 and I measure the BLTouch to be placed 20mm in front of fingerscrew, meaning my nozzles are actually placed exactly at my Y-Maxima, which is Y215. Front right is placed 153,6mm to the right of the center rear fingerscrew. Since my center is X97 it amounts to: 97+153,6 = 250,6 for first X coordinate. Front left is placed 153,6mm to the left of center. So 97-153,6 = -56,6 for second X coordinate. Rear center is placed at the center, so we use 97 for our third X coordinate. The trailing S3 defines maximum correction the leadscrews can do. Default is 1.
; Define the X and Y coordinates of the leadscrews. ; Motor order: Front right, front left, rear center. Now its sime to review our bed.g file to see if it’s still valid. It’s not really crucial where you probe, but you should try to make the probe points as close to each leadscrews as possible. I set all mine to 2mm from min and max for each axis.. just in case a wire or something got between my carriage and the printer edges. The Third point needs to take into account how BLTouch is placed 20mm in front of the nozzles, as it wouldn’t be able to probe at Y215 but at best at Y190. I’ve deducted the extra 2mm and landed on Y188. It might be a bit fiddly to figure it out, as the actual probing coordinates is for the nozzle, so can be confusing when looking at it. In a previous post we connected our BLTouch sensor physically to the Duet hardware and made some basic configurations as well. In this post I’ll talk about Probes and Sensors interchangeably and will be using the BLTouch name/model during this post, as that is the one I’m using to test this. If you want to read a bit of an intro into the differences between autolevel and autocompensation, I wrote a brief section about this in Is this autolevel? A box type printer with fixed XY gantries at the top, working together using the cross method to move a carriage around (like an Ultimaker and my xBot), and using a single z-motor to lift the z-gantry containing the printing bed surface. My xBot which uses the same XY cross-method, but has 3 seperate Z motors for the Z axis, making it possible to adjust it automatically for true autolevel. 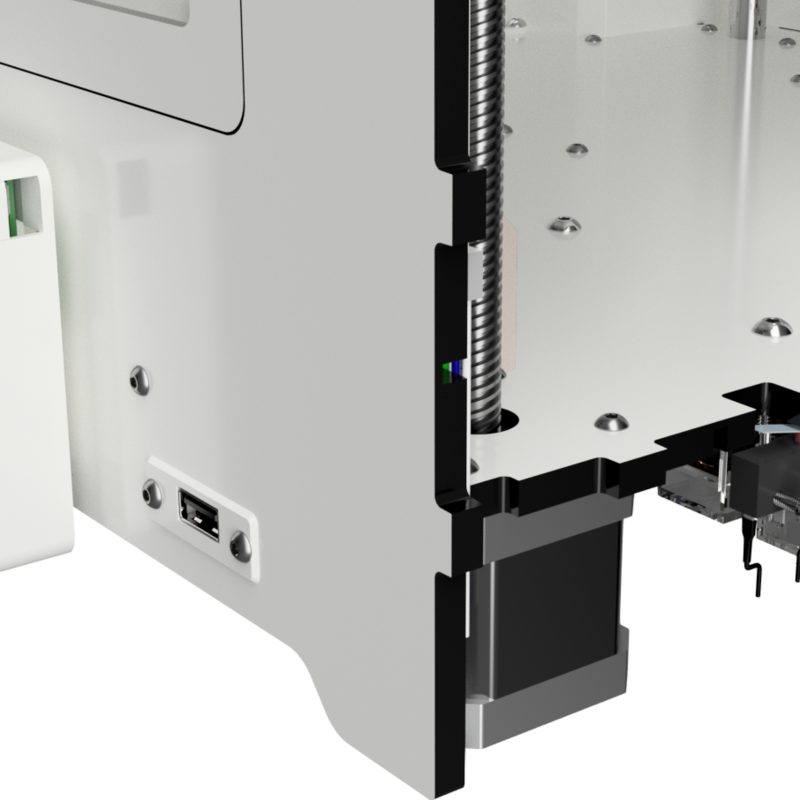 You can still use all information even if you are using a Tower printer (like Prusa etc), but I am going to be referring to the two machine models above throughout this post. i know very little about Delta machines, so I haven’t written with those machines in mind. Donate a Delta and I’ll write some how-tos on it ? Setup BLTouch in Config.g including defining Mesh Grid to probe using M557. Doing a Basic Single Probe using G30 before print start. You can use this process to do a manual bed leveling as well, by looking at the graphics output. Setup Slizer Startup Gcode to apply our Mesh Grid to the z-plane after doing the Autolevel Probing. When adding a Z-probe to your 3D Printer it also means introducing a lot of new terms and it requires a fair bit of setup to do and gcodes to learn to use. Most printers just have some sort of basic limit switch or maybe a hall or IR -sensor for X, Y and Z. This means a G28 command is enough to home all axes. By issuing: G28 XY you can opt to home X and Y at the same time without Z. This command will just home Z without the X and Y axes. The homeall.g file, which is executed using G28 without specifying any axes afterwards. This file normally homes all axes your machine might have. Important: When using a Probe located on Z-min (at your nozzle) and using the most basic/normal probetype with 1x Z-motor using Mesh Grid Compensation the Z-Max endstop will be disabled regardless of any virtual axes you might make to get around this issue! I am told that his is not the case when using a Delta type Printer. I am not familiar with Delta configurations. If you have 2 or more individual Z-motors and have configured Auto Bed Compensation in combination with Mesh Grid Compensation a Z-max endstop is mandatory (is it really?) in order for the Printer to calculate your Z plane accurately. In order to use a Probe we need to configure it using several new M/Gcodes, which we go through below. The actual button Auto Bed Compensation constitutes a G32 which can only be used if you have 2 or more independent Z-motors. When issuing a G32 command, the bed.g macro file is executed. I don’t know how to make the “Show Probed Points” active? The Disable Bed Compensation is used if you have Auto Bed Compensation in effect but want to disable it. This can also be done by issuing the M561 command which cancels any bed-plane changes you might have in effect by probing (or anything else). The M561 is also placed first in the bed.g file before doing a new Auto Bed Compensation run. G29 – Run Mesh Grid Compensation – Performs a Mesh Probe which is saved to a heightmap.csv file. By probing the bed you automatically enable it as well. You can use custom names. More on this later. The Show Mesh Grid Heightmap displays the grid performed by G29 graphically. The Load Heightmap from SD Card constitutes a G29 S1 command, which you would typically place in your startupgcode file in your slizer after the probing sequence. Disabled Mesh Grid Compensation equals G29 S2 and stops the printer from using the heightmap. Before we can run G29 we need to define the mesh to probe, which is done via M557 in our config.g file, which we will further down in this post under Define Mesh Grid. Bed.g is only used if we have 2 or more independent Z-motors. Tower printers would use this method if the Z motors are using seperate drivers. The bed.g file is used to define probe points using M671 in relation to our Z-motors. The bed.g file is not used if we do not have more than 1 independent Z-motor. You can even have multiple differently named heightmaps to use, if you for instance have different plates for different materials. M561 should always be used before running a new probe sequence of any kind. If we have 2 or more independent Z-motors we use G32 to do the probing sequence as defined in the bed.g file. Any Heightmaps you want to use is loaded after you have finished your probing sequence. The Black (GND) and White (Signal – Z Probe IN) which connects to the Probe Connector on the Duet Controller. Note: My “white” wire is red on this photo. PWM channel for Servo Function. The Brown (GND), Red (+5v) and Yellow(PWM) goes either onto a PWM/Servo connector on a Duex board or we use 3 pins in the 40-pin expansion-connector. Note: Regardless of wheter we use a Duex or not, I am going to be using Heater7 in my setup examples, which is PWM channel 5. I do this as it is the last one, so it’s easy to remember and it is physically the PWM channel on Duex which sits closest to the edge of the board. Here is he complete overview of pins used if you do no have a Duex board. For Duex owners, the Heater7/PWM5 is the connector you see on the middle left side here and the upper one is the Probe connector on the Duet Controller. Note: On the photo I have a resistor installed in the Probe Connector. This is necessary if you are using one of the older BLTouch models without the trace you can cut on the rear of it, to make it run 3.3v logic. Note: I had a machine where I thought I had cut the trace, but it wasn’t cut all the way, but it still worked, so you might be able to skip this. Ie mine worked fine even though it was still setup as running 5v logic, which means it was still without correct readings it seemed. Regardless of setup we need to create a deployprobe.g and a retractprobe.g file. These files are used to execute our probe as needed. This is not strictly necessary, but really usefull, so go to your Macro area and create a new Directory named BLTouch. You might want to create some more macros to quickly run your probe to the center of your bed and each corner etc. We need to make some changes in our config.g file in order to make use of our probe. Please note that some or all of these entries exists in your config.g file alrleady if you used the RepRapFirmware online configurator to create your files. We use M307 to disable Heater 7 to free up the PWM5 channel for our servo (probe). I’ve put this down with my oher Heater settings for hotend (M301) and heated bed (M307) in the config.g file. M307 H7 A-1 C-1 D-1 ; Disable the 7th Heater to free up PWM channel 5 on the Duex board. M574 X1 Y2 Z2 S1 ; X home to min. Y and Z home to max. Normally Closed limit switches. We need to remove the Z2 from this line, and add a new line defining Z as using a probe. M574 X1 Y2 S1 ; X home to min. Y home to max. Normally Closed limit switches. F is the speed of bed up/down movement. If it’s too slow the Probe pin might hit the bed and cause an error. T is the movement speed between probepoints. The X, Y and Z denotes which axes are used by the probe. X and Y are not used, while Z is. Next up we use G31 to define the Sensor’s offset from the nozzle in XY and the Bed in Z. My carriage with hotend and BLTouch looks like this seen from below. Note: if you build my xBot it most likely is further away due to the nature of the Carriage. We start with a Z offset of 0.0mm in regards to actual probe activation and factual distance. This value will be adjust later on, to match our setup. Important: It is important to have Z-offset at 0 before calibrating. P is the value needed to trigger the BLTouch. I’ve seen and tried a lot of different values between 25 and 600 and havn’t noticed any difference. But put a pin on this one in case your probe results are inconsistent. Next up we use M557 to define the grid on our printbed we want to probe, in order to create a Mesh the controller can use to compensate for surface inaccuracies. We start by typing M557 then define start and end points on our X and Y axes. Example below shows how we probe from X5/Y5 to X205/Y165. The Snn parameter defines the spacing between each probe point, where we have defined it to probe with 20mm interval. Hint: It can be useful to start out with a big interval like 40mm, to make the probing sequence faster, and it is useful to do some manual leveling based on the probing result. Afterwards, if you have individually driven motors, you do a fine mest for auto compensation when you can’t manually adjust it any better. Note: There is a maximum of 400 points available for probing, so making it too fine will result in an error. If you get an error, try raising the Snn parameter. Config.g changes Lets combine all our code snippets and put them in our config.g file at your current Endstop section. M574 X1 Y2 S1 ; X home to min. Y home to max. NC microswitches. M574 Z1 S2 ; Define Z to use Probe. Home to Min. M558 P5 H5 F500 T4000 X0 Y0 Z1 ; Set Z probe type/mode 5. Not using on XY, but using it on Z. Regardless of how your setup looks we also created a deployprobe.g and a retractprobe.g file. It isalso very usefull to creeate macros on various places on your bed. Ie in the front corners, center of bed and center rear and so on, depending on your setup. Now send G30 S-1 at which point the Pin drops down and the z-axis closes the gap until the BLTouch is triggered. Z now stops moving and reports the current position without changing anything. Note down the reported value. This means I’ll change the Z parameters in the G31 line from 0 to 0.98. Important: If you later redo the offset method you must set the offset to Z0 before starting or it might lead to strange results I’ve found on some occasions. This Mesh Grid consists of a lot of X, Y and Z coordinates. It can be very helpfull to use this to do some manual adjustment of the Z plane. Ie, meaning you try to make your printbed as level as possible manually by running some faster rougher sequences, and then use a final high resolution mesh sequence when done. The first Mesh Probe sequence I ran at 11:23 had a mean error of 0.182 and a deviation of 0.084. In normal words the rear bed was a tad higher than the front, so I gave the center rear screw half a turn and did the sequence again. This time the mean error went down to 0.077 and the deviation also decreased a good deal. You can hover the mouse over the probe points to see the XYZ coordinates. By Running the mesh grid compensation sequence by either clicking in the menu or typing G29 it will be saved into the file heightmap.csv and be activated. If you use multiple different surfaces as I do, you might want to have several heightmaps on hand. You can use M374 to save the heightmap with a different name than the default heightmap.csv. Below I’ve saved the heightmap as “bareplate.csv” as this is directly onto the surface of my PEI-Coated aluminium plate. I’ll be making different files for when I’m using glass for printing Nylon, FlexiPlate for PLA and so on. Before we can wrap up our configuration we need to adjust our homeing files to match. G1 Z10 F6000 ; Rapidly move the Z axis to Z=10. The G30 just probes and set Z to 0. The Offset we configured previously adjust the distance to match. I’m a bit confused here actually as it seems the machine uses homeall and then issue homez even if we havn’t made references to it in the homeall.g file. Can anyone shed light on this behaviour? Here I’m first homing my X and Y axis. Then clearing any Bed Transform I might have in place, as it would otherwise affect the probing. I’m then moving the probe to be at the middle of the bed. If it oozes, you might want to omit or change this. I’m then issuing the G30 command which brings my Z axis to close the distance between nozzle and bed and do the single probe. Now it’s time to load the heightmap we have created previsouly using our Mesh Grid. It is important this comes after the bed probe. You either use G29 S1 to load the default heightmap.csv or you use the M375 to load a custom heightmap. I’ve loaded my custom heightmap below. Now we have all the common stuff in place we are ready to look at the functions where we use the bed.g file to define how our individual Z-motors are placed and react when probing. Note: Remember I’m talking from a Box Printer perspective here, but you can use it just fine for Tower Printers just keep my references in mind! In order to use the multi z-motor functione we use he multi-probe gcode G32 when homing Z, which calls on the macrofile bed.g where we have multiple probe points instead of just using the single probe point defined via M557 in our config.g file, using the single-probe command G30. In order to put in some meaningfull coordinates in bed.g we need to know where our Z-leadscrews are in relation to our probe. 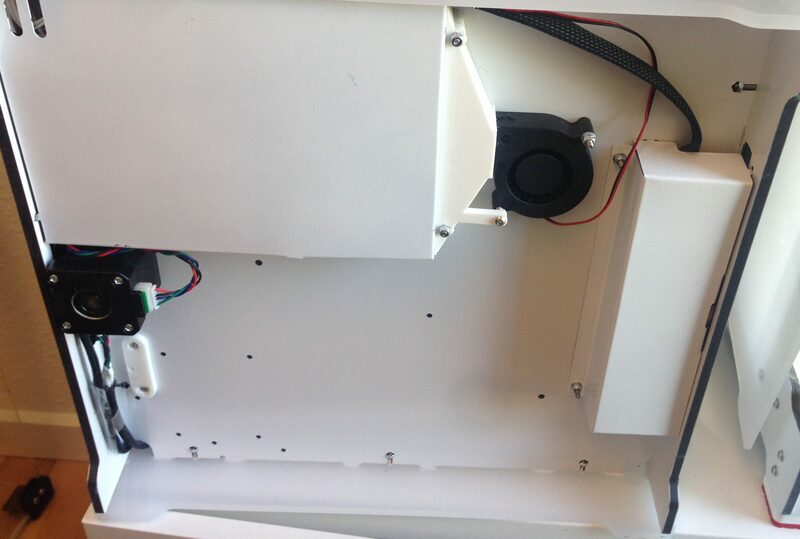 Here we can see the placement of my 3 leadscrews on my xBot printer, in relation ot the fingerscrews on my bed. I used the rear center screw to pinpoint the exact XY coordinate of the probe in relation to the screws. The numbers in the red circles are the placement and numbering of my Z-motors, while the square boxes indicates the coordinate and probe sequence of my bed.g file. The bed.g starts by issuing a M561 to clear any bed-plane fitting/transform we might have in place by a previous probing. Next we clear any heightmap we might have in effect as the height map should only be loaded after performing our bed leveling probe sequence. Deploy our probe using M401 which simply call on our deployprobe.g we created earlier. Now we come to the business of defining where we probe our bed. We issue the G30 command 3 times, starting with motor 1 through 3. It is 3 times as I have 3 independent Z motors. The S3 we have listed after our third line of G30 is crucial to the function, as it must be equal to the number of probe points/individual leadscrews we are using. The strange Z-9999 is there as a Z value less than -9999 causes the machine to probe at the current point to get Z, rather than using the given value. If an S field is specified (e.g. G30 P2 X100 Y165 Z-9999 S3) the bed plane is computed for compensation and stored which is exactly what we want here! if using a Tower Printer with 2 individual Z motors, you would put S2 after the last line instead. Now that we have probed one time pr leadscrew and set it up for computation we retract our probe using M402, which just calls our retractprobe.g file. When using the bed.g file to setup multiply points to probe in relation to the leadscrews, we need to define the XY position of the leadscrews in our config.g file. These coordinates will be outside our printing area and can as such be much higher and even have negative values. In order to define these, we use the M671 which I’ve placed above my Endstop section in the config.g file. The coordinates we fill in using M671 are the XY coordinates placed at each of the round numbers, in that order. Remember you can do this with just 2 individual Z-motors, and as such do not need 3 for full autolevel. Using 2 motors will only level the bed on one axis though, but that is still very neat. Next up we do the same with the Y coordinates and terminated by the optional S3 parameter – not to be confused by the S3 we used above! I used 3mm in the S as I had some issues with Z sync not working as I wanted it to do. It’s defaulting at S1, so you might do fine without specifying anything for S.
; Motor order: Front right (1), front left (2), rear center (3). Now everything is setup according to our system and we are ready to do an autolevel for the first time. I’m writing Autolevel as my machine is doing an actual true autolevel. If you use 2 z-motors you “only” level it on one axis where as the Mesh Grid applied after the autolevel is our Auto Compensation. You need to have homed the X and Y axes before starting, but aside from this, you only really need to type in G32 to do the magic. If you wonder, my homez.g file just home using a single probe action and rapidly moves the bed down again. I have this in place if I want to redo offset. I’m using Cura as my slizer, so I do not need all the “wait for temperature” gcodes of some other slizers, as these are automatcially in place – except for Chamber Heater, which you must add manually if using such a one. And my startup gcode for my xBot triple Z-motor machine. In this one I home it to XY and U. The U is my virtual axis I’ve made for Z in order for it to be able to home to Z max, which I can’t otherwise do. This doesn’t work with the setup for the single Z-machine. I have not yet had time to see if I can get around this, by using bed.g even though I don’t need it for that one. xBot Medium – A new printer is baking! Wow, been quiet for a while, and guess what, I’ve been busy working on completely new printer build, using the best I could find from the Open Source world and added on features I’ve been missing, like true autolevel and front hinged printbed in addition to the back mounted Z-stage on the Ultimaker machines. Note: Please note that some details has been changed during the design and buildphase. There, I said it. Ultimaker machines. This means I’ve been inspired by the Ultimaker 2 Open Source panels and did a complete workover to make it all match my needs. In all honesty it looks like a normal Ultimaker frame at first look, but when digging in the main left-over features are the hidden nuts and slot in system by the individual plates. Even those are placed totally different, so it’s only really the concept used. And of course the material used; 6mm Dibond. Of course; the construction method is one of two things making the Ultimakers what they are, so it would be silly to change these for something else! The second thing making Ultimakers the best, is how they have, in my opinion, the best XY design of all Open Source printers on the market. They do not risk skewing the axes when changing direction and have build in self-adjustments. In my optics it’s the best as it’s rock solid, simple to design and setup and requires next to no calibration or maintenance. You can move the printers around all day long, hook it up and print without any adjustments. I even shipped one of my Ultimaker 2+ machines (clones) across the country. The buyer opened the box, hooked it up and printed right away. No calibration or adjustments needed! Even did the same trick a few weeks later, so yea, they really are rock solid and requires next to no calibration. Except for bed level! The way the XY is incorporated into the very sleek case with hidden nuts, makes all axes very sturdy, which contributes to the unmatches printing quality of these printers. During the designface I managed to make room for 48mm deep Nema 17 motors, which meant we can use high quality 0.9 degree steppers (17HM19-2004S) now! Previously we could only get 40mm motors where all 0.9 degree motors (I have ever seen) has very high Inductance mH, which really must be under 4mH to get acceptable performances. All in all it just makes for an incredible appetizing package with both functionality and visual design at the fore. What can be improved on this package? There’s not much to change on the physical level, but the Z axis has always been the achilleius heel of the Ultimaker printers. It’s only fixed at the rear side and while the the Z rods has moved up in size from 8mm to 12mm, which improved a lot, the stability is just not as good as it could be. I’ve previously fixed the Lead-screw at the top, which helped stabilize the Z some, but the leadscrew is not meant for this kind of usage. Especially bad if using a poor quality lead-screw which isn’t all straight. I also created a method of using an Anti-backlash nut. Later on in the UM2+ and UM3 machines something similar appeared in the form of the T8*8 Delrim nut. The Brass version of Anti-Backlash nut has become very cheap and more popular as it’s a drop in replacement to the normal Brass nut. I’m a big fan of these Brass Anti-backlash nuts as they are cheap, drop in replacements and they compensate for both bad quality you might have in your lead-screws (and backlash nuts) and for the wear the nuts especially are going to be subjected to over time. Using regular nuts the gaps between the ridges steadily increase with wear and tear, leading to inaccuracies, especially when using z-hop, but the spring compensates for this kind of wearing down. To truly overcome this challenge I wanted to add 2 extra Z motors with additional z rods at each front corner, for a total of 3 Z-motors and 4 Z-rods, to make it more stable and also to build in the option for true auto-level function. All without making the machine huge and bulky! 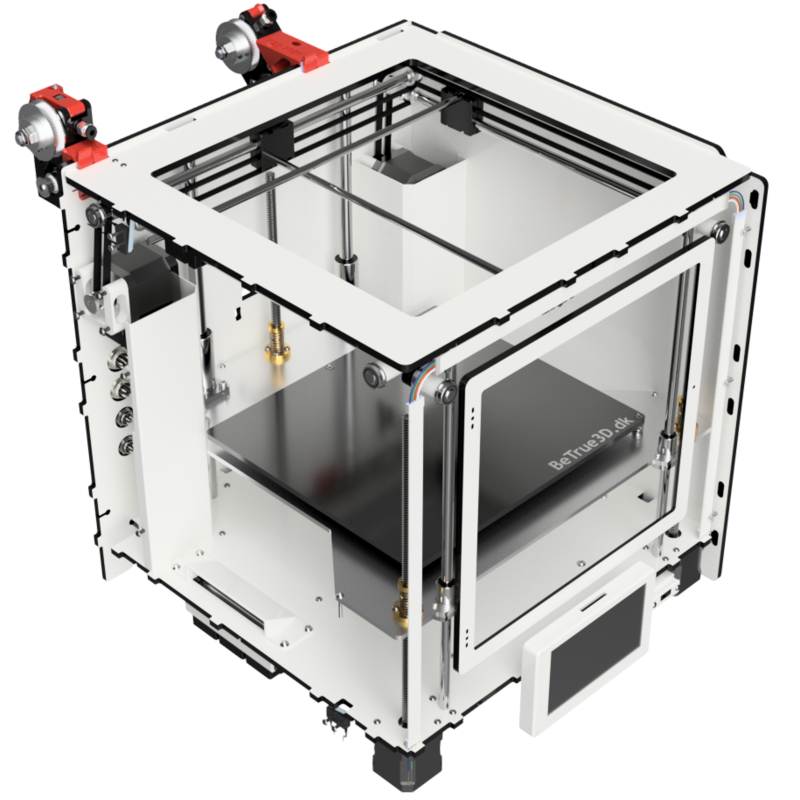 Note/Disclaimer: All info and images of/about the Ultimaker is from Ultimaker 2+ specificatiosn page and the Printer Comparison Page. They belong to Ultimaker and all credits goes to them. I am in no way affiliated with Ultimaker and I solely show the info here to show where I came from. I have tried making the below table to illustrate and explain the changes and differences between the super nice Ultimaker 2+ and the xBot Medium I’m building. File Transfer: WiFi drag and drop for standalone 3D printing. Optional printing from SD card if the optional PanelDue is in use. Heated Bed: 100w (24v 5a) 2mm aluminium heater. Guided leveling of buildplate Heated Bed: 500w (240hz AC (Mains) via SSR) Silicone Keenovo heater under 5mm milled Aluminium plate. Print Surface: PEI-Coated Aluminium plate. Optional 4mm Borosilicate glass or Fiber plate etc. You can use Ultimaker 2 heated bed if you so choose. Same mountpoints. Thermocoupler Daughterboard for 2 Thermocouplers. Using Duex2 or Duex5 for full use of autolevel and multiple extruders. 1.8 degree motors for XY. External Meanwell 24v 15.8 (black brick type) Internal Meanwell 25v 18.9a with temperature controlled cooling. Small LCD control panel with SD card Optional PanelDue color touch display with SD card. To the best of my abilities I’ve kept it as close to the Ultimaker 2 as I could. 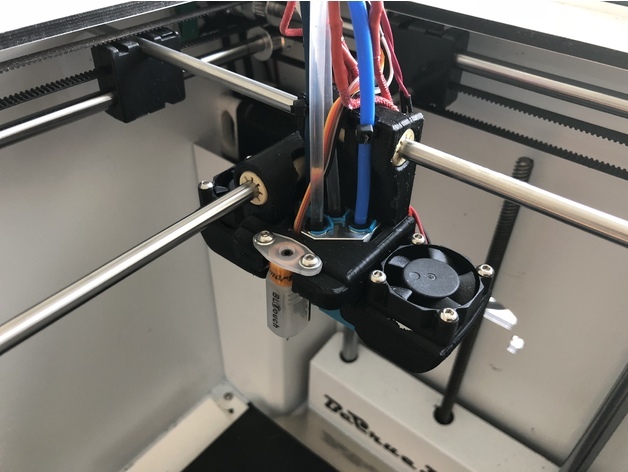 This means most things can be directly reused, if you have build a previous UM2 clone, like belts, pulleys, heated bed, finger screws, screws/nuts , XY endstops, all the bearings and the thick 12mm Z rods. Also using same Z motors, although the xBot is using 3 of those. You can even reuse your extruder if you have a Titan or UM2 extruder, allthough I do recommend using my Belted Extruder v4 as it’s way more quiet and performance just as well. In the back plate there are holes if you want to use an extruder as in the normal Ultimaker machines. I havn’t sunk the holes all the way through for Titan extruder, but they are marked up on the files, so it’s easy to remidy it. Same goes for the various Optional settings in other plates like front USB plug, manual LED on/off switch and the two optional mount holes for PanelDue, if you choose to use one. Instead of full wire draws I’ve opted to use the Aviation plugs in sizes GX16 for the wireharness up to the Carriage for Heater Cartridge, Temperature sensor, heatsink fan and printed object fans. A second GX16 for the BLTouch or some other sensor as well. I’ve used 4x GX12 4pin Aviation plugs for the 4x top mounted Extruders on the rear side, and also a single GX12 4pin connector, installed in the bottom part of the frame, next to the Chamber heater vent, for the 4 wires up to the heated bed. Here are 2 photos from a different machine to illustrate how the GX12 plugs will be placed on the rear side. All the wires going through on the photos here, will be replaced with the larger GX16 Aviation connectors. I have ordered linear motors and parts from Robotdigg, quality steel rods from Dold Mechatronic and have put in an order for the Dibond plates here in Denmark with a private person, so can’t link to him… so now it’s just waiting time for me over Christmas. The X and Y motors are high quality 0.9 degree motors (17HM19-2004S) from OMC-Stepperonline which can fit in there due to room for 48mm motors compared to Ultimaker’s room for 40mm motors only. .. or.. Actually I’m busy working on creating documentation for a Github page for this project where alle the relevant files will be publicly available. I have in fact allready created a Repository for the xBot Medium on Github and started putting various files and info in it, so please stay tuned. The STEP files for the side panels will not be made publicly available untill I’ve tested them. 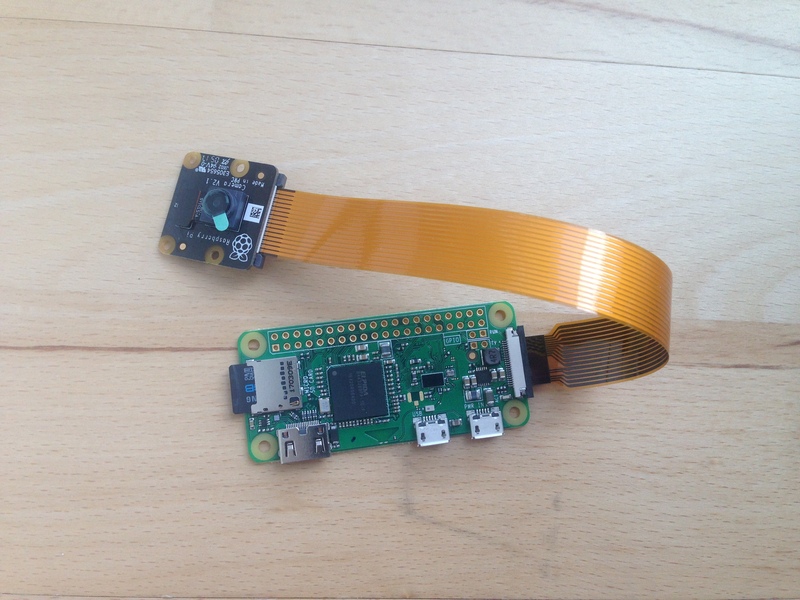 Just the other day I wrote the post on setting up Video on the RPi Zero W to use on the Duet. This post is ending up pretty much the same place, where we can access the video on our Duet Web Interface (and much more), but instead of using the full Raspbian install for it, we are going to use the much smaller and specialized MotionEYE OS. For this project I’m going to use one of the tiny Raspberry Pi Zero Wireless controllers, 8GB SD card or larger and a Pi NoIR Camera V2. Using the NoIR as I wanted to try it out, and the NoIR makes it possible to record in the dark using IR lightning. I’ve found it’s also pretty nice just in my average dim room. You also need one of the camera cables for the Zeros, as they are tapered in one end compared to the normal ones. They come in 15cm and 30cm lengths. Go the the download page for Motion EYE OS and download the one for motioneyeos-raspberrypi-. If you look at the filezie, it’s obvious how it’s very lightweight and specialized at 68MB for complete OS (225MB uncompressed) compared to the 4GB of our previous Rasbian installation! To make sure there are no unmarked bad areas on the SD drive, I strongly recommend getting a proper SD formatting tool, like SD Formatter, and do a format. Make sure to pick the right drive, give it a name, choose OverWrite in Options and hit Format. Unpack the file and write image to SD using Etcher. Run Etcher as administrator if you run into problems. Be patient.. it takes a while. When it goes from writing data to the SD to Validating, Windows might throw some errors at you, but that’s normal, so don’t worry. As opposed to our previous Raspian venture, we need to make a small file for our USB drive containing the necessary information about our Wireless LAN. On windows I’m using the standard Notepad to create this file. I’ll not recommend using Notepad++ or some such as they are often more smart than they should be. Replace MyWiFiNetwork with the SSID (name) of your Wi-Fi network, and password123 with your password, making sure to keep the quotes, as above. If you copy paste the above into a notepad document, make sure to make the correct line breaks. Now lets dig out our RPi camera and the special RPi zero camera cable. Loosen the tabs on both devices and insert the ribbon cable as shown. Do not put the devices on top of the antistatic bag. It works the opposite of putting the devices inside it, so don’t do that! I know many people are doing this all over the internet, but you really, really do not want to do that. Now insert SD card into your RPi Zero Wireless and power it up.. sit down and wait 5 minutes. Unless you have configured IP manually, or have a screen connected, you need to figure out the IP of your device. There are several ways to go about doing this, but the easiest way is to download and run the Angry IP Scanner. Some antimalware programs pops up warnings on this program, but it is due to its functionality to scan ports and such, and not because it contains malicios code. So, start it up and just hit Start. It’ll scan a while. Then sort the results by clicking on the column named Ping. Mine showed up like this, where the standard client devices like computers and printers are going to have a blue icon on the left hand side, so it’s easy to spot. Same with the Web detect on the right hand side, which isn’t normal for standard devices. Depending on the browser size you are going to see a small image in the corner, or a fullscreen view. Click the icon looking like a person in the upper left corner, and switch Username to admin and leave Password blank. Make sure Video Device and Video Streaming is turned on. You might want to turn on Motion Detection as well instead of just having it on always. As our last basic setup we are turning up our resolution a bit. Go into Video Device and select the Video Resoluton and Frame Rate fitting your requirments. This opens a small popup with an address, which you copy and then paste into the Optional URL to an external Webcam in the Duet Web Interface. In order to integrate the videostream into the Duet Web Interface, we need the direct url for our videostream. For this project I’m going to use one of the tiny Raspberry Pi Zero Wireless controllers and a Pi NoIR Camera V2. Using the NoIR as I wanted to try it out, and the NoIR makes it possible to record in the dark using IR lightning. Grab newest Raspbian version. I’m using the full version. Maybe Lite is enough for our purpose? If you downloaded Raspbian and imaged it using Etcher rather than NOOBS, then you will boot directly to the desktop environment of Raspbian and won't need to wait. I ended up having to download using Torrent which took 8 hours less than the regular download! To make the SD last longer, I strongly recommend getting a proper SD formatting tool, like SD Formatter, and do a format. Make sure to pick the right drive, give it a name and hit Format. Write image to SD using Etcher – it can open .zip files without extracting it. Or you can get Win 32 Disk Imager for more options. Note: For some reason it didn’t want to work with my normal SD card-reader, so had to dig up a different one! I had some issues, as mentioned above, so ended up unpacking it manually, which is why the source filename is different in the two images here. I used usb keyboard and mouse, which I had to switch back and forth, since I couldn’t find my USB-hub, to connect the RPI to my WiFi and to activate VNC. Next up I need to get myself a VNC viewer for my PC to connect to the RPI from my PC. Do not use it on your RPi to connect to the RPi! Just press Got It, on the first welcome screen. It looks like options with the icons above, but they aren’t. Enter the IP and then use the default username pi and password raspberry to connect. You want to change these at some point. I now have access from my PC and am ready for our Camera. We do not need to activate the camera using commands, since we enabled the Camera further up top alongside VNC. Now we need to update before continuing setting up the Camera. If you are used to use sudo apt-get upgrade instead of the dist- you might want to read about the differences. You can find the test.jpg file using the File Explorer, where the photo should be placed at your home directory. There is a larger guide here. I had planned to install the software Motion, as I had read a nice guide, but it turned out it just didn’t want to work with my Noir V2 camera, so I decided to look elsewhere. I also learned the project is no longer in the hands of the original author and has not been updated for a while. I decided on using RPI-Cam-Web-Interface instead although it is a webinterface, which isn’t strictly what I want for my Duet WiFi purposes. But I hoped it would make the raw videostream available, which it turned out to do. The interface options also makes it easier to setup the different options as I’m not much of a linux console kind of guy. There is a nice wiki guide, which I’m pretty much just following. 1 command pr line. Wait for each to finish. Short explanation: First it downloads the program, change to the folder, makes all .sh files executable and then installs it. A window is going to pop-up after a while. I just used default settings under installations. Note: I’m not entirely sure what the checkboxes are meant to do. I can find no differences if I check the Embed Webcam Stream or not? I thought about modifying the firmware, but I didn’t know the pin numbers on the controllerboard, or even if they were controllable. It would also be rather restrictive for many people, as they run original firmware. I’m going to achieve my goals using a Mosfet control board (example, example), so we are not going to solder seperat small components together, but just wire things together combined with a few wire-connectors (Can do without if you absolutely have to). I am using this model as I’ve had best general results with this. In our previous blog-post series, we focused on buying stuff premade. 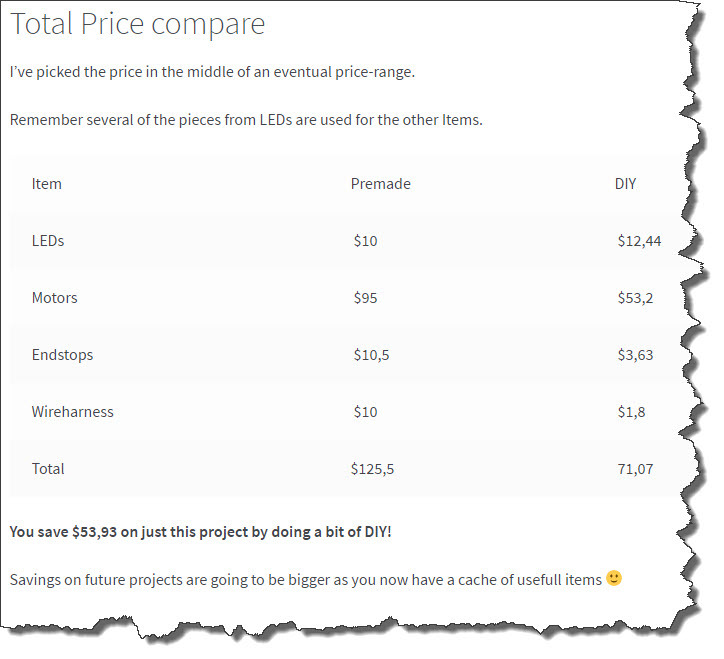 The big saving is going to show if you like to tinker with stuff, as you’ll have bought yourself a nice cache of spare-parts for this and other projects. You need a soldering iron for this and some basic tools. It might be usefull to buy an actual crimping tool, but it’s not mandatory. I bought this 5m led strip for $5.84. it’s not really the best quality, but it works fine. Next we need to get some wires. I rather like to buy 1m rolls of multicolored wires from RobotDigg. 1M doesn’t sound like much, but there are 30-40 wires of 1m each in a roll, and it’s very usefull to get thme like this. Price is from $1.8+ depending on how much you buy. You need 1 roll of the black-red bundle. If you like to make other projects, I recommend buying one or both of the 3-color and 5-color rolls as well. We’ll look at wires for motors elsewhere on Aliexpress. We are going to buy a box of connectors. These will come in very handy for any number of projects. We need some heatshrink to put onto our parts, where we solder things together. I can recommend buying both a set of black and one of red pieces, but 1 color is going to work fine. If you want it just right, you need a white set as well, for the front LEDs, allthough you can’t see these when done. I used 3x 30cm LED strips, but these lengths are determined by the LED roll you buy, as they can be split up in different lengths. Remember to slide on heatshrink before you solder both ends of the short wires – speaking from experience, hehe. Test the wires using a 24v source. You also MUST clean up the inner face of the front-panel using Acetone or the LED strips will come loose. We need 3 motors for XY and Extruder + a motor with build in leadscrew for Z. We need 67cm of wires on your motors and appropriate connectors. The leadscrew on Z-motor is around 36cm long. Do not buy a motor and loose leadscrew. You are loosing a lot of Z-height and it’s not as good. Especially if you use a flexible coupler. I have only listed Robotdigg as they have cheaper motors and we are going to buy wires and stuff from them as well. But remember to factor in the shipping costs when you decide on where to buy. One draw-back is that you need to shorten up the axels of the motors or they are going to hit the rear and side respectively. You need to twist the cable pairs. First twist red/blue and black/green, and then twist the resulting 2 bundles. They are all configured as NO (Normally Open) in original firmware. This means the wires is connected as shown on the photo. Wire colors, blue, red and black are in place in order to know what’s what. Remember the the lengths of the wires for our Extended is not the same as in the pdf files. Expect to pay around $0.2-0.3 for each limit switch. Search around for prices if you like. You might want to find a set of 10 if you want to have some spares, or some for other projects. DIY set costs $3.63 and you’ll have a lot of spares. The Wireharness consists of the wires from carriage (carriage is the assembly for hotend and fans) to controller. Since the wires from Heater Cartridge and PT100 temperature sensor runs straight down to the controller on their own, the Wireharness is really only for the small Heatsink fan and the 2x cooler fans. If you want the right colors you should buy 1 more roll of wires from Robotdigg. I’d replace the blue one with a white wire, as the blue wire isn’t included in any of the wire bundles. Connectors from LEDs and Endstops. Phto above shows the one I made for this project. I’ve picked the price in the middle of an eventual price-range. Remember several of the pieces from LEDs are used for the other Items. You save $53,93 on just this project by doing a bit of DIY! Spotted irregular movement of my back slider, in my newly build Ultimaker 2+ Extended and thought I’d share how to check your rods. How to check if your rods are straight. They look straight and feel straight, but when mounted it is easy to see they if they are not. Simply place the slider in the middle of the rod you want to check. Move the carriage back and forth. The slider should be still. No movement at all. As you can see, this slider moves up and down as I move the carriage back and forth, so it needs to be discarded. If you can’t see how the slider moves up and down, then try focusing on the belts connecting to the slider.